America you have elected the phoniest “politician” in history to the Presidency. Without any fact checking or background analysis, voters in 2008 elected Barack Hussein Obama as the 44th President of the United States. 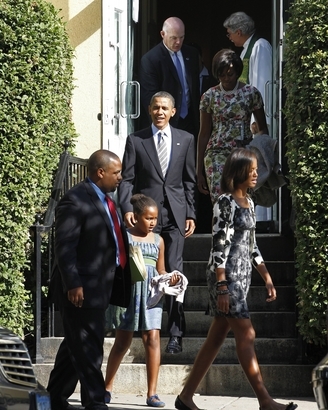 After the Pew Research Center poll said that nearly one in five Americans believe Obama is a Muslim, he and his family finally attended church services on Sunday. A blatant political move, orchestrated for the press and cable news to “prove” his Christianity. If America believes this crap and every thing else Obama and his Democratic majority have rammed down our throats then there is little hope for the country. But I have faith in the voting public and they will wreak their revenge for their awful mistake this November. The swamp may not be drained, but enough incumbents will fall by the wayside like cord wood to make the hallways of Congress walkable. Barack Obama has been a disgrace as President. We expect our Commander In Chief to lead by example and be above the fray of petty political posturing. But not Barack, he has to belittle, demagogue, insult, mock and laugh at any one who does not agree with him. True, this is the Chicago machine’s way of doing business, but we did expect better of him. Prior to November 2008, Obama traveled the globe, speaking in Turkey, Germany, France and Great Britain to adoring crowds, with empty words. As President he has proved to be inadequate to the challenges and unable to rise above his own ego to be a man of the people. If there ever was an example of an “Imperial President”; Obama is the hands down winner. Barack, looks down on the “little people”, his “subjects” and tells them how to live, what to do and except his big government entitlement philosophy. The state of our economy and this nation have proved him, Pelosi and Reid very wrong. It’s time to take out the trash and sweep these elitists from power on November 2nd, 2010. The future of our country rests in this upcoming mid term election.